Adyapana Higher education & Career Exhibition organizers of LECS organized a Educational and career exhibition in Jaffna, Sri Lanka under the theme name of “Kalvi Jaffna”. 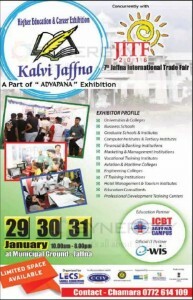 The Kalvi Jaffna 2016 exhibition will concurrently with Jaffna International Trade Fair on 29th to 31st January 2016. This is a great opportunity for students on Northern Province to select international educational programme and scholarships under one roof Kalvi Jaffna exhibition in Jaffna.